I heard on Radio 4 this morning that in Japan they have brought out a Green Tea Kit Kat. A Green Tea Kit Kat? Surely these two are not natural bedfellows? 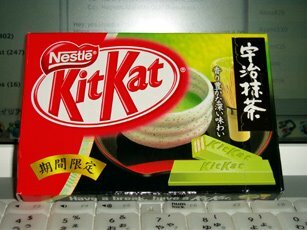 I love both green tea and kitkats but somehow the thought of this combination makes me feel a bit sick. Here's a picture I found on t'internet. Not exactly an appetising colour is it? Not sure even Phil would try those. I bought a load of Green Tea sweets for the office on my trip to China. They really are much nicer than they sound. The only things that raised eyebrows were the Wasabi and Green Tea coated peanuts, but even they were great. It's a shame that Nestle target these special editions at specific nations, rather than releasing them world wide, because these are probably really nice. Shame about the colour though. The special edition Caramac KitKats were pretty good, but I'd really like to try these! Green Tea flavoured food is usually quite nice. The Green Tea ice-cream at WasabiSabi on London Road in Sheffield was good. And the Wasabi and Green Tea coated peanuts that Chris brought back from China were really tasty. Perhaps Wasabi coated KitKats would be good too...? Wasabi peas: They are the way forward, and don't let anyone tell you otherwise. Plus you can get the greatest green tea chocolate at L'artisan du chocolate (the world's best chocolate shop, in London). Green food is usually wrong. what, you mean like vegetables?